Dear organizers, participants and guests of the Festival! 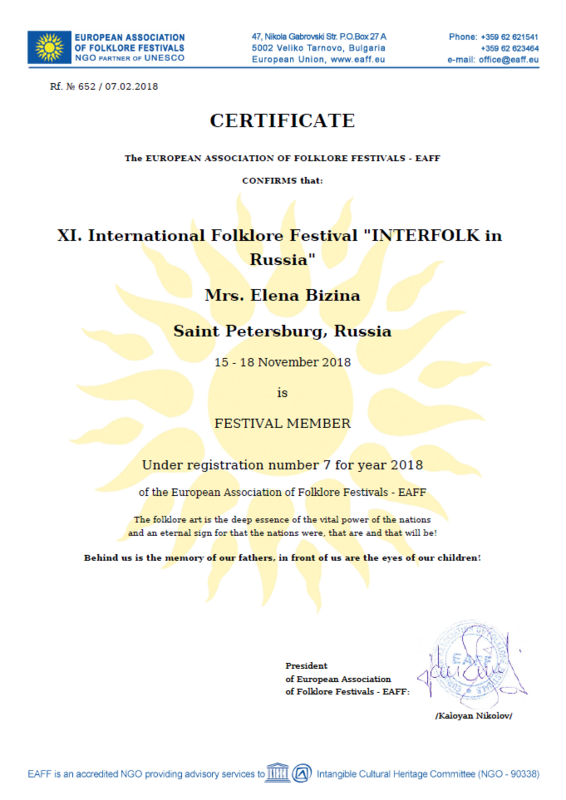 I am sincerely glad to welcome you at the 11th International Folklore Festival «INTERFOLK in Russia»! The annual «INTERFOLK» festival in multinational St. Petersburg is both a holiday and a meeting place for friends. Promoting mutual enrichment of cultures, it has turned into a genuine triumph of friendship between nations. With its melodious folk songs, fiery dances and magical sounds of ethnic musical instruments, it wins hearts, uniting people of all ages, nationalities and religions. Each performance of the Festival participants embodies the treasures of the people’s souls, their national traditions and customs, historical and cultural and spiritual values, erasing linguistic, national and political boundaries and creating a single cultural space under the auspices of unique ethnic creative traditions. «What the land is, so are the springs», the popular wisdom says. 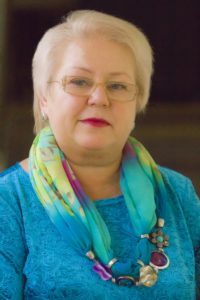 I am convinced that, thanks to such events as the International «INTERFOLK in Russia» Folklore Festival, the springs of spirituality, brotherhood and mutual understanding will never run out. Embodying the ideals of peace, goodness and harmony, it allows everyone of us to feel our historical involvement in the best traditions and values of not only the whole multinational Russia, but the world itself. I sincerely wish the ethnic festival successful, fruitful work and further prosperity, and its participants — good health, well-being, peace and harmony! Today the ideas of tolerance are more in demand than ever and relevant in our society, and culture is the most efficient and affordable way to put them into practice. Concerts of the «INTERFOLK in Russia» festival on the stage of the «Cascade» Cultural Center promoting the best traditions of national art from different countries have become a good tradition in the Petrodvorets district. «INTERFOLK in Russia»is a celebration of folk music, dance, costumes, rituals, games, friendship and the joy of life. The festival provides an opportunity for talented participants to represent the culture and achievements in the art of their countries and regions at the international level. From year to year the festival makes us happy with its creative discoveries and amazing performances. The «Cascade» cultural center is a long-time partner of the festival and we are very happy to host this colorful holiday. After all, the festival has successfully achieved its lofty goals for many years, helping to improve mutual understanding, strengthen solidarity in relations between ethnic, cultural, religious, linguistic groups and nations, thereby confirming that the future of the World lies in interaction, companionship and exchange between people of different countries and nationalities. 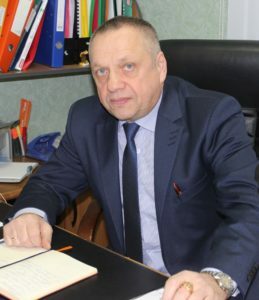 It is with great joy and deep respect that I welcome the participants, members of the jury and guests of the 11th International Folklore Festival and competition «INTERFOLK in Russia» on behalf of the municipal entity Morozovskoye urban settlement of the Vsevolozhsk district, Leningrad Region. The festival is an opportunity to rise above the everyday bustle, feel joy and inspiration. It will give us all an unforgettable chance to meet the most original groups and performers of our time, to open the diverse world of cultural traditions of various nations. 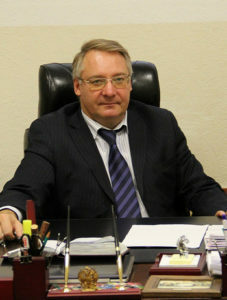 It is pleasant to realize that having this festival in the Morozovskoye urban settlement is becoming a good tradition. This is the fifth year that the N.M. Chekalov House of Culture has been not only a participant of the «INTERFOLK in Russia» festival, but also provided one of the concert venues for the festival events. I sincerely wish all the participants of the contest colorful and memorable performances, excellent mood and well-deserved victories.